Happily, in Joseph in the New Testament by Fr. Larry Toschi, OSJ, is a wonderful chapter, "Joseph, the Man of Dreams". Since I can't include the whole thing here, following are excerpts that I especially liked. "In Joseph's dreams it is ággelos kuríou, the 'angel of the Lord,' who appears to him. This exact phrase is found repeatedly and consistently in the Septuagint as a translation for 'the angel of Yahweh,' who is sent with most important messages to Hagar (Gen 16:7-12), Abraham (Gen 22:11,15), Moses (Ex 3:2), the people of Israel (Jgs 2:1-4), the barren wife of Manoah (Jgs 13:3-5), Elijah (1 Kgs 19:7; 2 Kgs 1:15), and Joshua the high priest (Zec 3:1-10). The types of communications in the dreams cited above and those through the angel of the Lord are most similar, and it is not so surprising that for Joseph these two forms are combined, so that he invariably awakes with total faith and no doubt whatsoever about their interpretation. "... Matthew has shown how Joseph received the vocation to be a key personage in Jesus' infancy, and how that role can only be fulfilled by a special charism, a charism which was communicated to him by an angel of the Lord in dreams, in the way that God communicated to his patriarchs and prophets in the Old Testament. ... In the New Testament, this role and this manner of divine communication are unique to Joseph, so that he alone can be called a 'man of dreams,' a title previously given to his namesake, the patriarch Joseph (Gen 37:19)." "Such strong similarities with the Old Testament literature do not mean that Joseph is an invention created by Matthew on the basis of scriptural patterns. His dream narrations are not midrash in the sense of reflecting on Old Testament events to make them intelligible, but rather are descriptions of the historical nucleus of events surrounding the early years of Jesus Christ understood against the background of the Old Testament. "... Matthew's portrayal thus communicates the multi-leveled truth that Joseph has a patriarchal role to play in connection with the prophetic mission of Christ. As a privileged recipient of multiple, combined forms of divine communications, and as a perfectly obedient man of faith who collaborates with all that is commanded him, he recapitulates the history of salvation of Israel, which has reached its definitive culmination in the child he names, protects and raises. The man of dreams who took the child and his mother to Egypt and back is the last of the patriarchs, who receives revelation about the promised descendence in the style of the Old Testament shared by no one else in the New Testament or thereafter." Yay! 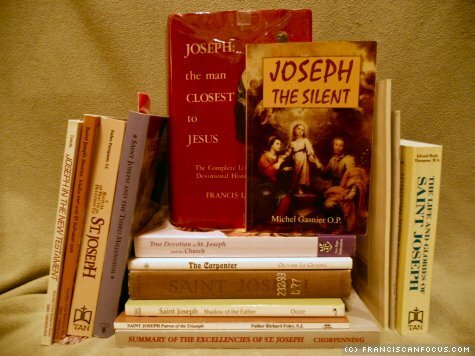 The Life and Glories of St. Joseph is one of your books! I saw it in a pile o' books a friend of mine is reading (she's in preparation to become a Lay Carmelite!!!) and it has the St. Joseph looks like great-granpa image on the front (booo) so I had to come check your list of Josephy books! PS I'm using her computer and having difficulty commenting, so I'm commenting as Anon E. Mouse if you know what I mean and I'm guessing you'll guess who I am... speaking of which - have you checked your calendar yet?